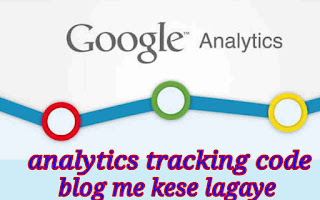 Hello friends aj is post me google analytics tracking code apne blog me add kaise karte hai iske bare me bata raha hu. Google analytics kya hai or google analytics account kaise banate hai iske bare me pichhli post me bata diya hu yadi apne post nahi read kiye hai yo “google analytics account kaise banaye” is post ko read kare or apna google analytics account create kare or aj ham is post me analytics tracking code ke bare me bata raha hu. 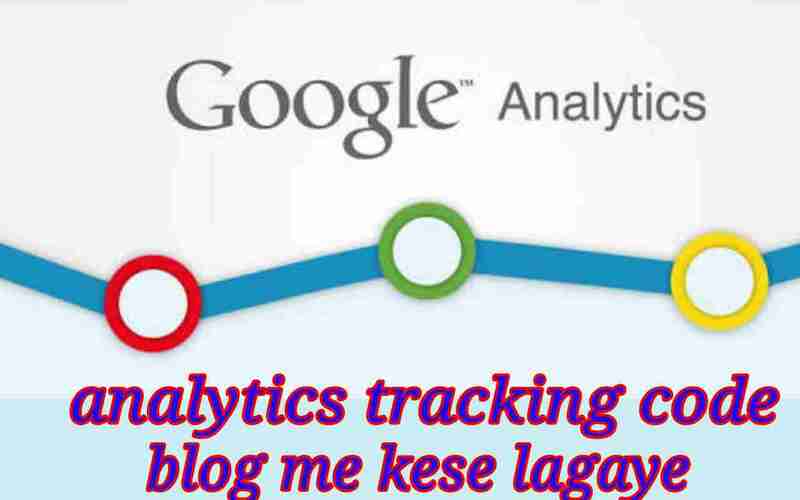 Apne blog or website ke liye google analytics account banane ke bad ham apne blog se analytics ko connect karne ke liye apne blog me analytics tracking id add kar dete hai jisse hamara blog google analytics se connect ho jata hai or hamare blog ka data jese, traffic, pageviews, bounce rate, users, etc analytics account me show hone lagta hai. Blog me analytics tracking id add karne par hamare blog ka data analytics accou me show to karne lagta hai par kabhi kabhi hamare blog ka data analytics me show hona band ho jata hai jisse ham apne blog ke traffic ke bare me thik se nahi jan pate hai, par yadi ham chahe to apne blog me google analytics tracking code add karke apne blog ka traffic regularly analytics me show kara sakte hai. Analytics tracking code ek script hoti hai jo hame apne blog ke theme me add karna hota hai jisse hamare blog ke traffic ko aasani se collect kar pata hai or hame apne blog ki real traffic show karta hai yadi apke analytics account me bhi apke blog ka data show nahi hota hai to ap apne blog me tracking code add karke apne blog ke real traffic ko analytics me dekh sakte hai. 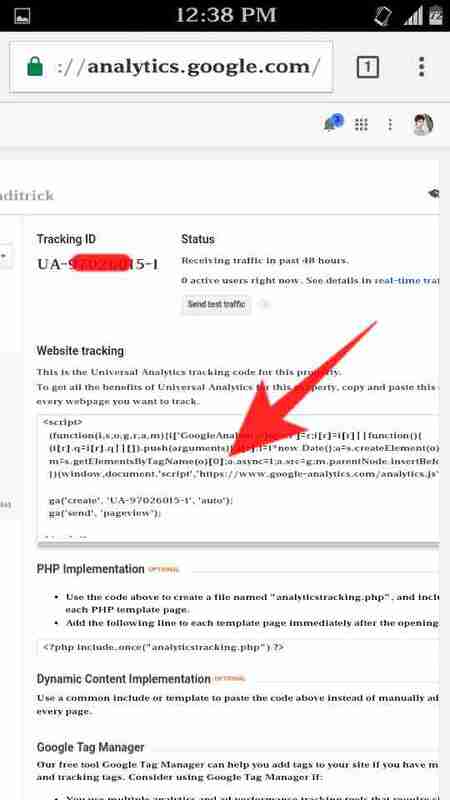 Apne blog me google analytics tracking code add karne ke liye aage bataye gaye sabhi steps ko thik se follow kare uske bad ap bhi tracking code jarur add kar payenge. 1. Sabse pehle ap googke analytics website open kare or apne account me login kare. 2. Google analytics account me login ho jane ke bad Ab ap admin par click kare. 3. Ab ap yaha par tracking info par click kare. 4. Tracking info par click karne ke bad kuchh option dikhai denge ap tracking code par click kare. 5. Ab yaha par apko tracking code (script) dikhai degi us tracking code ko copy kare. 6. Ab ap blogger dashboard open kare. 7. Blogger dashboard open karne ke bad ab ap Theme par click kare or uske bad Edit HTML par click kare. 8. Ab HTML code par kahi bhi click kare or </head> code search kare. 9. </head> code milne ke bad copy kiye huye google analytics tracking code ko </head > ke upar past kare. 10. Tracking code past karne ke bad save theme par click kare or theme save kare. 11. 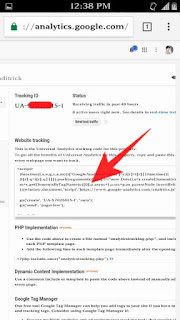 Ab apke blog me google analytics tracking code successfully add ho gaya hai. 12. Ab 24-48 hours me apke google account me apke blog ka traffic show hona start ho jayega. Is type se ham apne blog me analytics tracking code add kar sakte hai or tracking code se apne blog or google analytics account ko connect kar sakte hai, google analytics account or blog ko connect karne ke bad ab hamare blog ka real traffic google analytics account me show hona start ho jayega.